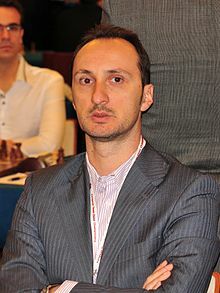 Veselin Aleksandrov Topalov (pronounced [vɛsɛˈlin toˈpɑlof]; Bulgarian: Весели́н Александров Топа́лов; born 15 March 1975) is a Bulgarian chess grandmaster and former FIDE World Chess Champion. Topalov became FIDE World Chess Champion by winning the FIDE World Chess Championship 2005. He lost his title in the World Chess Championship 2006 against Vladimir Kramnik. He challenged Viswanathan Anand at the World Chess Championship 2010, losing 6½–5½. He won the 2005 Chess Oscar. He was ranked world number one from April 2006 to January 2007. He regained the top ranking in October 2008 until January 2010. His peak rating was 2816 in July 2015, placing him joint-tenth on the list of highest FIDE-rated players of all time. Topalov has competed at nine Chess Olympiads (1994-2000, 2008-2016), winning board one gold in 2014 and scoring best overall performance in 1994. He also won in Linares, Corus, Dortmund, Stavanger and Pearl Spring tournaments. Over the next ten years Topalov ascended the world chess rankings. He played in Linares 1994 (6½/13), Linares 1995 (8/13), Amsterdam 1995. In a strong run of tournament performances in 1996 he placed third at Wijk aan Zee, tied for first at Amsterdam, Vienna and Madrid, won outright at Novgorod and shared first in Dos Hermanas. As early as 1996, he was being invited to events for the world's elite such as Las Palmas (5/10), the first category 21 tournament, played in December 1996, with Kasparov, Anand, Kramnik and Karpov participating. The next year he won at Antwerp and Madrid. Topalov's loss to reigning Classical World Champion Garry Kasparov at the 1999 Corus chess tournament is generally hailed as one of the greatest games ever played. Kasparov later said, "He looked up. Perhaps there was a sign from above that Topalov would play a great game today. It takes two, you know, to do that." In 2001, he shared the overall title at Amber Melody and won at Dortmund. In the knockout tournaments for the FIDE World Chess Championship, he reached the last 16 in 1999, the quarter-finals in 2000, the final 16 in 2001, and the semifinals in the 2004 tournament. In 2002, he lost the final of the Dortmund Candidates Tournament (for the right to challenge for the rival Classical World Chess Championship) to Peter Leko. Topalov tied for first at the 2002 NAO Chess Masters in Cannes and won at Benidorm in 2003. Topalov scored his first major success at Linares 2005, tying for first place with Garry Kasparov (though losing on tiebreak rules), and defeating Kasparov in the last round, in what was to be Kasparov's last tournament game before his retirement. He followed this up with a one-point victory at Mtel Masters. In 2006 he tied for first at Corus with Anand. Topalov is married and has two daughters. Based on his rating Topalov was invited to the eight-player, double round-robin FIDE World Chess Championship in San Luis, Argentina, in September–October 2005. Scoring 6½/7 in the first cycle, Topalov had virtually clinched the tournament at the halfway mark, before drawing every game in the second cycle to win by 1½ points to become FIDE World Chess Champion. The average rating of the field in the championship was 2739, and Topalov's performance rating was 2890. On 16 April 2006, FIDE President Kirsan Ilyumzhinov announced that a match between Classical and FIDE World Champions Kramnik and Topalov would be held in September–October 2006 to re-unify the Championships after thirteen years of separation. Kramnik defeated Topalov to become the first undisputed champion in thirteen years. On 28 September 2006, Topalov's manager Silvio Danailov published a press release, casting suspicion on Kramnik's behaviour during the games. The Bulgarian team made a public statement that Kramnik visited his private bathroom (the only place without any audio or video surveillance) unreasonably often, about fifty times per game (a number that FIDE officials later claimed to be exaggerated) and made the most significant decisions in the game in the bathroom. They also demanded that the organizers of the tournament allow journalists access to the surveillance video from Kramnik's room for games 1 through 4. The organizers made parts of the video available, explaining that other parts of it were missing due to technical issues. Danailov demanded to stop the use of private restrooms and bathrooms, and threatened to reconsider Topalov's participation in the match. The Appeals Committee that governed the match agreed, and ruled that the players' private restrooms should be closed and replaced with a shared one. Kramnik refused to play game 5 and was forfeited. On 1 October, the restroom issue was resolved in Kramnik's favour and the Appeals Committee resigned and were replaced. The FIDE president Kirsan Ilyumzhinov decided that the current score of 3–2 should be preserved. He also indicated that this was not a compromise decision but his own. The match resumed on 2 October 2006. On 1 October, the Association of Chess Professionals released a statement denouncing Danailov for publicly accusing his opponent without evidence, and calling for him to be investigated by the FIDE Ethics Committee. On 3 October, Topalov said in a press conference, "I believe that his (Kramnik's) play is fair, and my decision to continue the match proves it". However the next day the crisis escalated, with Topalov's manager strongly implying that Kramnik was receiving computer assistance. On 14 December 2006, Topalov directly accused Kramnik of using computer assistance in their World Championship match. On 14 February 2007, Topalov's manager released pictures, purporting to show cables in the ceiling of a toilet used by Kramnik during the World Championship match in Elista. They were supposedly reported to the authorities, who Danailov claims suppressed the information. The Topalov team claims they were pressured by officials to keep their allegations quiet. On 29 July 2007, following a complaint by Kramnik's manager Carsten Hensel, the FIDE Ethics Commission sanctioned Topalov with "a severe reprimand" because of the accusations made in the interview of 14 December. According to the Ethics Commission, "these statements were clearly defamatory and damaged the honour of Mr. Vladimir Kramnik, harming his personal and professional reputation". Soon after losing the match, Topalov finished third of four players in Essent with only 2½/6, losing both games against Judit Polgár and one against Shakhriyar Mamedyarov. In May 2006 Topalov defended his M-Tel Masters title, coming first with 6½/10, a half point ahead of Gata Kamsky. In January 2007 Topalov finished in joint first place at Corus along with Levon Aronian and Teimour Radjabov. In May 2007 Topalov won the M-Tel Masters tournament for a third consecutive time with 5½/10, defeating then- leader Sasikiran in the final round. In November 2007 Topalov won the Vitoria Gasteiz charity event. Topalov won the 14th Ciudad Dos Hermanas rapid, 17–21 April 2008, defeating GM Francisco Vallejo Pons (Spain) 2½–1½ in the final match by winning the first game and drawing the rest. In September 2008 Topalov won the Bilbao 2008 tournament. He advanced to first in the world in the official October 2008 ratings list. He also won the Pearl Spring event held in Nanjing as well as Villarobledo Chess Festival. Topalov lost his chance to compete in the 2007 world championship tournament when he lost the 2006 reunification match. Danailov expressed a desire for a rematch between Topalov and Kramnik, proposing a match in March 2007, though no such match took place. The issue was settled in June 2007 when Topalov and Kramnik were granted special privileges in the 2008–09 championship cycle. Topalov was given direct entry to a "Challenger Match" against the winner of the Chess World Cup 2007. The 2007 Chess World Cup was won by Gata Kamsky. The Challenger Match between Topalov and Kamsky took place in February 2009 in Sofia. Topalov won the match 4½–2½ . The World Chess Championship 2010 match was held in Sofia, Bulgaria, which Topalov lost by 6½–5½ margin. Topalov won the 2010 Linares chess tournament held in February, defeating Boris Gelfand in the last round. Before the World Chess Championship 2010 match with Veselin Topalov, Vishwanathan Anand, who had booked on the flight Frankfurt–Sofia on 16 April, was stranded due to the cancellation of all flights following the volcano ash cloud from Eyjafjallajökull. Anand asked for a three-day postponement, which the Bulgarian organisers refused on 19 April. Anand eventually reached Sofia on 20 April, after a 40-hour road journey. Consequently, the first game was delayed by one day. As runner-up in the World Chess Championship 2010, Topalov automatically qualified for the Candidates Matches for the World Chess Championship 2012, where he was the top seed. However, he lost to newly crowned U.S. champion Gata Kamsky in the quarterfinals. Later that year he won the King's Tournament in Romania. Topalov competed in the FIDE Grand Prix 2012–13. Having won in London's Grand Prix event in 2012, in April 2013, he won the 2013 Renova Grand Prix in Zug, 1.5 points ahead of second-place Hikaru Nakamura. This marked his comeback as one of the top five players in the world, as this victory propelled him to the fourth place on the FIDE rating list. By scoring 100 points in the 2013 Grand Prix in Beijing, he guaranteed himself a first-place finish with one tournament to spare, thus qualifying for the 2014 Candidates Tournament. Topalov played in the 2013 edition of the Norway Chess Tournament. He placed 8th with 4 out of 9 possible points +0-1=8. From September 18 to 25, 2013, Topalov played a 6-game match with Viktor Láznička. Time control was 40/90 + G/30 with 30 seconds increment per move. Topalov won the match 4-2. Topalov competed at the Candidates Tournament 2014 in Khanty-Mansiysk, Russia. He finished in last place, scoring +2-4=7. Topalov played in the 2014 edition of the Norway Chess Tournament. He placed 5th with 4.5 out of 9 possible points. Topalov played in the 41st Chess Olympiad in Tromsø, where he won the gold medal on board one, with the second best overall tournament performance of 2872. In August–September 2014, Topalov played in the Sinquefield Cup 2014, where he came in 3rd place behind winner Fabiano Caruana and runner-up Magnus Carlsen. Topalov participated in the 2014 European Club Cup in mid-September 2014. Topalov came third at the Gibraltar Masters. Topalov competed in the 2015 Grand Chess Tour, consisting of Norway Chess, the Sinquefield Cup, and the London Chess Classic. At Norway Chess 2015, Topalov won clear first place with 6.5/9, earning him 13 Grand Chess Tour points. He scored +5-1=3. At the 2015 Sinquefield Cup, Topalov finished in a tie for sixth place with a score of +2-2=5. In the London Chess Classic in December 2015, he came in last, scoring +0-4=5. He played in the Chess World Cup 2015 in Baku, Azerbaijan as the top seed. He was eliminated by Peter Svidler in the fourth round. Veselin Topalov participated in the Candidates Tournament, held in Moscow, Russia from March 10–30, 2016, as a rating qualifier. Topalov finished in last place, losing 5 games (+0-5=9). Topalov participated in the Paris Grand Prix, part of the Grand Prix cycle. Topalov scored 12/36 for ninth place. Topalov participated in the Leuven leg of the 2016 Grand Chess Tour. Topalov scored 14/36 points, which placed him in 10th place in the tournament. In April 2018, he participated in the fifth edition of Shamkir Chess, finishing eighth with a score of 4/9 (+2–3=4). Topalov has competed on first board at nine Chess Olympiads (1994-2000, 2008-2016), winning individual gold in 2014 and scoring best overall performance in 1994. After 17 moves, Topalov initiates a series of strong tactical blows with the sacrifice of a knight and a rook. On the way to winning M-Tel Masters in 2005, Topalov defeated former FIDE world champion Ruslan Ponomariov with the white pieces in a Queen's Indian Defense. ^ "(C16) 1993-1996 Zonal Cycle : World Chess Championship". www.mark-weeks.com. Retrieved 2016-08-22. ^ "1993 Biel Interzonal : 1994-96 cycle : FIDE World Chess Championship". www.mark-weeks.com. Retrieved 2016-08-22. ^ "Veselin Topalov vs. Garri Kasparov, Moscow Chess Olympiad". ^ "The Week in Chess 83". theweekinchess.com. Retrieved 2016-08-22. ^ "The Week in Chess 113". theweekinchess.com. Retrieved 2016-08-22. ^ "Champion Kasparov's In A League Of His Own". tribunedigital-sunsentinel. Retrieved 2016-04-09. ^ "Topalov wins Benidorm". 2003-11-30. Retrieved 2016-08-23. ^ "Elista 2006: the latest before game seven". ^ "Silvio Danailov accuses Kramnik of using Fritz 9". ^ "Topalov: the Kremlin will not admit that Kramnik cheated." ^ "Essent 2006 Mamedyarov, Judit Polgar are the winners". ChessBase.com. 2006-10-29. Retrieved 13 October 2011. ^ "Веселин Топалов спечели "М-Тел Мастърс 2007, българинът победи в последния кръг индиецa Кришнан Сасикиран". topsport.bg. Retrieved 21 October 2014. ^ "Chess Champions League – benefit in Vitoria Gasteiz". 2007-11-03. Retrieved 2016-08-22. ^ "Topalov Wins Dos Hermanas Rapid". ChessBase News. 21 April 2008. Retrieved 2008-04-21. ^ "Topalov wins Villarrobledo Chess Festival | Chessdom". tournaments.chessdom.com. Retrieved 2016-08-23. ^ "Topalov back in Bulgaria, seeks rematch". ^ "Results & Games – Anand–Topalov – FIDE World Chess Championship 2010". 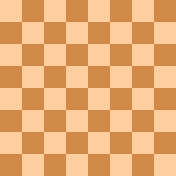 Anand-Topalov.com. Retrieved 13 October 2011. ^ "Topalov wins Linares, remains number two in the world". ChessBase. 2010-02-25. Retrieved 30 March 2011. ^ "Chess News – A volcanic trip – with the Lord of the Rings". ChessBase.com. 21 April 2010. Retrieved 31 May 2010. ^ "Chess-Results Server Chess-results.com - 41st Olympiad Tromso 2014 Open". Chess-results.com. Retrieved 2014-12-01. ^ "Pairings & Results". Grand Chess Tour. 2015. Retrieved 31 October 2015. ^ "Veselin Topalov vs. Ruslan Ponomariov, Sofia 2005". Chessgames.com. 2005-05-21. Retrieved 2014-12-01. Wikimedia Commons has media related to Veselin Topalov.